As spring creeps up on us, eager lovers of wildflowers will soon begin exploring Minnesota’s forests and natural areas looking for rue anemone, hepatica and Canada mayflower. They will be out again in summer to look for white prairie clover or horned bladderwort; and in fall, searching for signs of white rattlesnake root and heath aster. As they head out on these trips, wildflower lovers should be sure to pack a copy of Searching for Minnesota’s Native Wildflowers: A Guide for Beginners, Botanists and Everyone in Between (University of Minnesota Press, release date: May 15, 2018) along with their sunscreen and mosquito repellent. Written by noted children’s author Phyllis Root and photographed by her friend Kelly Povo, the book is based on more than a decade of plant-hunting trips the two took around Minnesota, from the Big Woods of southern Minnesota to the North Shore. 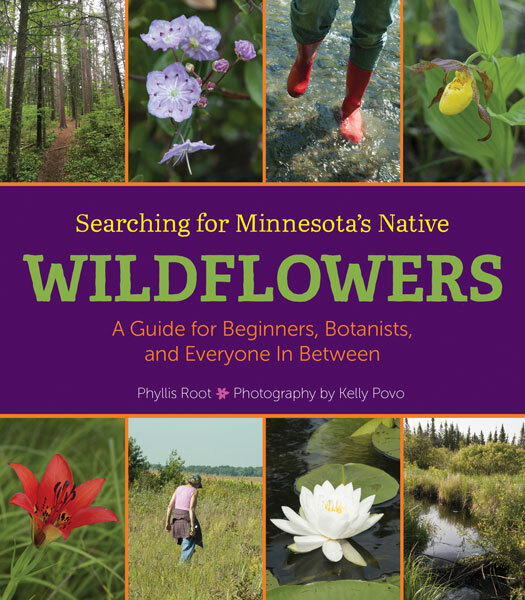 The book begins with a description of Minnesota’s native wildflowers, why they matter and how to find them. This includes a guide to identifying plants by their structure, where they are found and which plants they grow with. It also includes helpful information on where to look for plants and how to dress and what to put in your backpack on plant-hunting expeditions. The bulk of the book is a “Year of Native Wildflowers.” Root and Povo take readers through the seasons and the various Minnesota ecosystems (deciduous and pine forests, prairie, lakeshore). Each season has its delights and surprises, and the “field notes” in the book cover the reactions of the two friends as they hunt for snow trilliums during what feels like an endless and endlessly snowy spring or discover how beautiful a bog can be. The book includes plant descriptions and lots of photographs, but I especially appreciated the suggestions of where to go to find Minnesota’s native wildflowers. With many state parks, scientific and natural areas and other wild spaces, Minnesotans are fortunate to have many places to find native wildflowers. And, now, we have a book to tell us where to go and when. been waiting for this book to hit the bookshelves…so excited! It looks beautiful.